The contractor worked at the north side of Monroe Street NE Bridge within the construction zone, installing and securing proposed reinforcing steel cage for piers, and back wall at abutments in preparation for concrete placement. Concrete placed on west abutment back wall. Contractor also excavated and installed proposed conduits, encased, backfilled and compacted at the intersection of 8th Street and Monroe Street NE. Trenches secured using steel plates. All traffic maintained with two open-lanes eastbound and westbound. The contractor worked at the north side of Monroe Street NE Bridge within the construction zone, installing and securing proposed reinforcing steel cage for piers in preparation for concrete placement. Concrete was placed on east and west abutments seats. Contractor also excavated and installed proposed conduits, encased, backfilled and compacted at the intersection of 8th Street and Monroe Street NE. Trenches secured using steel plates. All traffic maintained with two open-lanes eastbound and westbound. The contractor worked at the north side of Monroe Street NE Bridge within the construction zone, installing and securing proposed reinforcing steel cage for piers in preparation for concrete placement. Concrete placement is scheduled for tonight. Contractor also excavated and installed proposed conduits, encased, backfilled and compacted at the intersection of 8th Street and Monroe Street NE. Trenches secured using steel plates. All traffic maintained with two open-lanes eastbound and westbound. 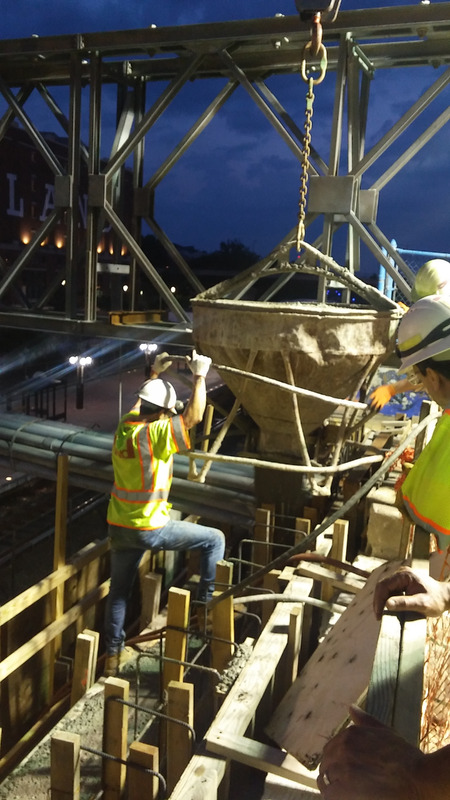 The District Department of Transportation (DDOT) would like to extend its appreciation for your patience and understanding, while we continue working on the Reconstruction of the Monroe Street Bridge over WMATA & CSX tracks. As part of this project, DDOT’s contractor will be performing pier/concrete placement from Friday, June 1 at 3:00am to Saturday, June 2 at 4:30am. There will be heavy equipment on site behind the barrier east of abutment A2. The bridge will remain open during this activity except for a 5-minute hold on traffic to allow for a bucket swing over the west bound lane. Pedestrians will be able to access the sidewalk at all times. We realize this may cause some inconvenience to the neighboring community and we thank you for your patience while the team works to complete this project as quickly and as safely as possible.